Do an Internet search for ‘smart meter’ and the results aren’t pretty. Most of the top results are articles or blog posts complaining about smart meters and pretty much suggesting that everybody that has one is going to get cancer. To that, I say, hogwash. In fact, I’ll go so far as to say that I love my smart meter. Yes, I used the word ‘love’ and even if I’m the only person in the world, so be it, but I think as time goes on, more people will find that their smart meter is not something to complain about, but instead something to embrace. First of all, what is a smart meter? For those that might not have yet been introduced to the concept, a smart meter is a different version of the standard electrical meter that sits on the outside of your house that measures usage. 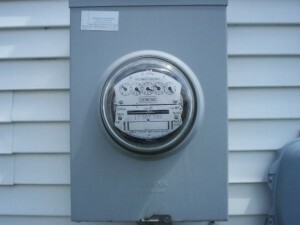 The traditional meter has dials that have to be read to calculate energy usage. A smart meter has a digital display. In addition, a smart meter transmits this data on a regular basis to the electrical company. This data transmission is where people seem to have the problem and think that they’re evil. I’m here to tell you that they’re not. Say there’s a big storm and your power goes out. You have to let the power company know by picking up your phone and calling them, right? Not so with a smart meter. A smart meter, by design, will check in every few minutes, so if the power company sees that a meter or group of meters is not checking in, they’ll know that the power is out. They’ll also know the size of the outage. Now, of course it doesn’t hurt to call the power company anyway to report the outage, but if you have a smart meter, chances are they already know by the time they take your call. Three times out of the last twelve months, our gas bill was completely off. Two of those were during the winter months, when snow made it hard for someone to come read the meter, so they estimated our usage. The other time someone either read the meter wrong or wrote down the wrong number, so our bill was much higher than expected. A meter that isn’t smart. Although they fixed it, I had to make a call and spend time traipsing outside to get an accurate reading. With a smart meter, the meter transmits your usage and that creates your bill. Simple as pie. No estimated bills. No mixing up of numbers by someone reading the meter. Ever since our smart meter was installed a few years ago, we’ve had 100% accurate results. Our power company offered us a device that allows us real time tracking of our electrical usage. All I had to do was plug the device in, plug it into our internet router, install an app, spend a few minutes while the device and our meter synced up, and now I can go into the app at any time and see real time usage. I’ve gone through the house, flipping on and off lights, or turning on and off appliances, and have seen the change instantly. Data like this can help people make better decisions. And, I think the possibilities even go beyond that. We sometimes go away during the winter months. We can launch the app, while we’re away, and see that usage is taking place so that we know the furnace is cycling on and off at a regular basis. Say we logged into the app and saw a stop in the pattern, we might know that we’d better call someone so that we can avoid coming home to burst pipes. This is a localized program for our company in the Detroit area. I’m guessing that it or something like it will eventually be standard so that we we can individually tap into the smart aspect of the smart meters. Even though smart meters are regularly sending out pings and data information, it’s only actively transmitting around 1% of the time. All things considered, if you’re really worried about invisible communication waves frying your brains, smart meters are probably pretty far down the list of real, actual problems. One of the concerns that people have is that they actively choose to put wi-fi routers and cell phone routers and other devices in their home, where often they don’t have a choice in whether a smart meter is installed. The power company just shows up. While I see this as a concern, I think, again, that of all the things to fret about over which we have little or no control, there are many others things that I think would come up above a silly, old electrical meter. Readers, what do you think about smart meters? Would you pay not to use one? Would you use the monitoring and real-time tools available? We don’t have a smart meter yet, but I won’t mind it when they add them in. I love the idea of them for your basic two reasons – they will know faster when we have an outage and our usage data will be correct. Sounds like a winner to me! They are definitely nifty for those two things. Man I hope we get #3 that would be a valuable tool to cut utility costs. We have smart meters and I am a fan. Around here on days of high electric consumption they will have “energy days” and they use the smart meters to gauge your usage and conservation efforts. The reward is for every KWH you conserve they pay you $1.25 despite the fact that they are charging 15-16 cents per KWH. This Summer so far I have saved around $30…Pretty cool program IMHO ….. Interesting, though the renters could have different habits that could play into the difference in bills. More and more things are going to get connected over the next few years. It’s a great convenience but not without its challenges. Hopefully some solid standards develop to address consumer privacy and safety concerns. I love the ideas personally… just need to make sure the product producer/provider is a solid company that takes things seriously. I guess the way I look at it is that this is a public utility that has federal regulations but is also publicly traded. Point being that there are many stakeholders that have an interest in making sure that things are done right. This seems like a no brainer, but I am not sure we have Smart Meters in our area yet. When we do, I am definitely up for giving them a shot. We have a smart meter, and it works just fine. I think it’s an advantage to have as it offers less hassle on our part and I can know how much electricity we’re consuming aside from bill. Smart Meter sounds very interesting. I had never heard of it, but for some time I cast a look at your blog and it caught my attention !